Since my postcard from Forst (Lausitz) in December I’ve travelled the length and breadth of Germany by rail (even stopping off to hear you speak at the Schwarkopf Stiftung in Berlin), and today I am sending you a virtual postcard from Mannheim. 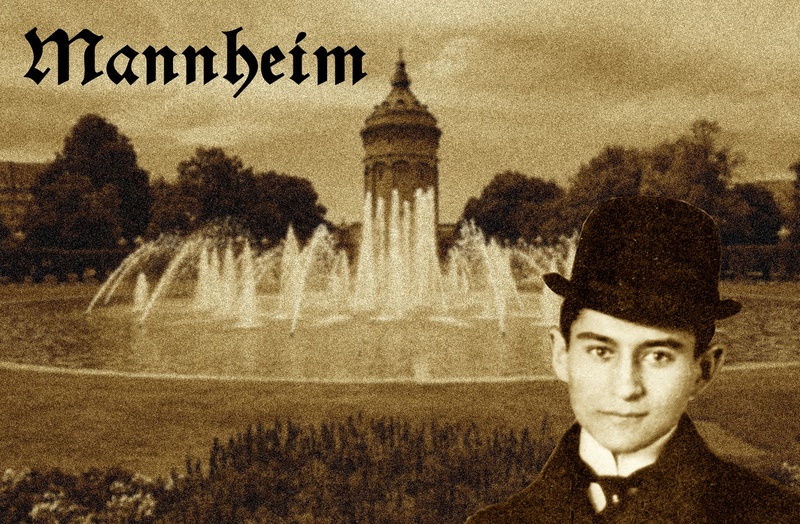 I have no idea whether Franz Kafka ever travelled to Mannheim, but the situation I faced there when on a trip from Paris to Berlin by rail was positively Kafkaesque. I had a Deutsche Bahn ticket for the Deutsche Bahn train ICE 9551 (Paris Est – Frankfurt Hbf), changing at Mannheim onto a further DB train to Berlin. Yet for unsubstantiated reasons, ICE 9551 was delayed in France – they even parked us on a side track for a while to allow TGVs to overtake. Yet as passengers we had no idea what was going on. The train manager only made an announcement there was even a problem a full 20 minutes after the timetabled time to arrive in Forbach. As the delay rose so my fellow passengers and I worried about our connecting trains. No guard or train manager had been seen in the train since somewhere just outside Paris. So, fearing the worst, I set out to find the train manager, who had stationed himself in the restaurant car. Why, I asked him, have you not come and explained to passengers what is happening? Why have you not helped passengers deal with missing connections? He shrugged his shoulders, and pointed to his colleague “That’s his responsibility” he said. The problem of course is that the employee who shrugged, and was the train manager, works for SNCF, and the junior colleague towards whom he pointed works for DB. This train is run by a DB-SNCF cooperation known as Alleo. There’s no competition here, Violeta. What do you think about that? The EU’s biggest rail companies are supposed to be partners. The problem is when it comes to making a complaint. I was not going to let this issue lie. So at Mannheim (with the time to spare because I had missed my connection), I contacted Deutsche Bahn using this form. Their response, the following day by e-mail, was that there was nothing they could do because the employee in question works for SNCF. Complain to SNCF they said. So I try to complain to SNCF with this form, but because my ticket had a Deutsche Bahn ticket number, SNCF’s form refused to accept the complaint. So back to Deutsche Bahn I went, explaining the predicament, and a friendly employee called me. Have you looked at Alleo’s website he ventured. Yes – it’s under construction and unusable! (screenshot here, URL of the site) We’ll forward the complaint for you was the further vague answer. So how is this for rail collaboration between the EU’s two central, founding Member States? It seems the collaboration is geared up in the interests of the companies, and not the passengers. Don’t you think, Violeta, that if I pay good money to travel by train I could at least be entitled to some decent information, and a clear way to complain if something goes wrong? @Jamie – thanks for the reply, and that seems very fair to me from Loco2’s point of view! I actually, personally, do not have a test case here. Whenever I’ve been delayed it’s almost always the responsibility of DB, and I have not yet had any difficulty getting compensation for delays (the story in this blog entry is not about the delay as such). If I do personally encounter such a case then I’ll be happy to pursue it with the European Commission if CIV does not work adequately. Equally if there are any passengers that have an interesting story they’d like me to cover here I’d be happy to do so! Sorry for taking some time to share my thoughts on this. As evidenced by the above discussion, and the text of the relevant CIV regulations themselves, there is a lot of ambiguity. Despite this, our experience with Loco2 so fas has shown that in the vast majority of cases, train staff are reasonable and accommodating in the case of delays, with only a handful choosing a strict interpretation of the rules that comes down against the passenger and forces them to purchase new tickets. Because this is a question of liability, no single rail operator is likely to come out and state their willingness to take full responsibility, and so we definitely think that the rules needs to be cleared up significantly. This responsibility falls to OTIF http://www.otif.org but clearly there could/should be involvement by the European Commission and the UIC http://uic.org as well, and I won’t claim to understand how these organisations are supposed to relate to each other in a regulatory sense. In the meantime, due to the fact that the operators in general tend to be reasonable and lenient, here at Loco2 we are broadly happy to compensate passengers out of our own pocket in the event that operators do choose to force passengers to purchase new tickets (we will of course exhaust any possibility of the rail operators taking responsibility first). In future we also intend to explore a more formal insurance offering in order to guarantee compensation. I’d be happy to hear any further thoughts about how Loco2 can tackle this issue. Obviously we can only assist passengers who book through us, and we unfortunately don’t have the time/resource to fully engage with the above-mentioned bodies on an ongoing basis. @slkljasgkla / @skgölkasölgkas – could you possibly comment with the *same* random combination of letters? Then your comments will automatically be approved. @slkljasgkla – Oslo-Göteborg – yes. Now booked. NSB was cheaper for the service I need to take. At least NSB finally allows these to be booked through SJ again (wasn’t possible a couple of years ago). And yes, I am on an Öresundståg from Göteborg to København H. You’re right – even if you put a Zwischenhaltestelle in DB’s trip planner to give you a connection onto the SJ X2000 from Malmö to Göteborg it will not let you book it for a Sparpreis. Only Øresundtåg here if you want it cheaply it seems. I’ve never had a problem getting seats on Øresundståg at off peak times, so have not even tried to reserve. I have 1 hour to change in Göteborg – the train from Oslo arrives at the very minute the train to København leaves. So I have to wait a full hour. Awful timetable planning. @Hans – yes, sorry, CIV 1080 is the main number, but I do have the others in brackets too. Was not aware those were the CIV codes. I’ve found CIV damned incomprehensible, so am trying to work it all out. I’ve luckily – so far – never been severely delayed when doing a Norway – Sweden – Denmark – Germany trip, so have not had to have recourse to this so far. And thanks for the German lists as well – handy! And Paris – yes, that would be handy if RZD changed its timetables a bit! So, DB – having not dealt with the complaint – said it would send me some Gutscheine. These have arrived. They’re for restaurants in trains. Not even for travel! 🙁 €20 worth. On an Europa-Spezial Schweden ticket, it would usually say “CIV 1080” in the upper left corner, and then there is a line at the bottom where it says “VIA” with three codes (for example 1080, 1186 and 3126) and various intermediate stations. The codes which count are the ones on the “VIA” line. 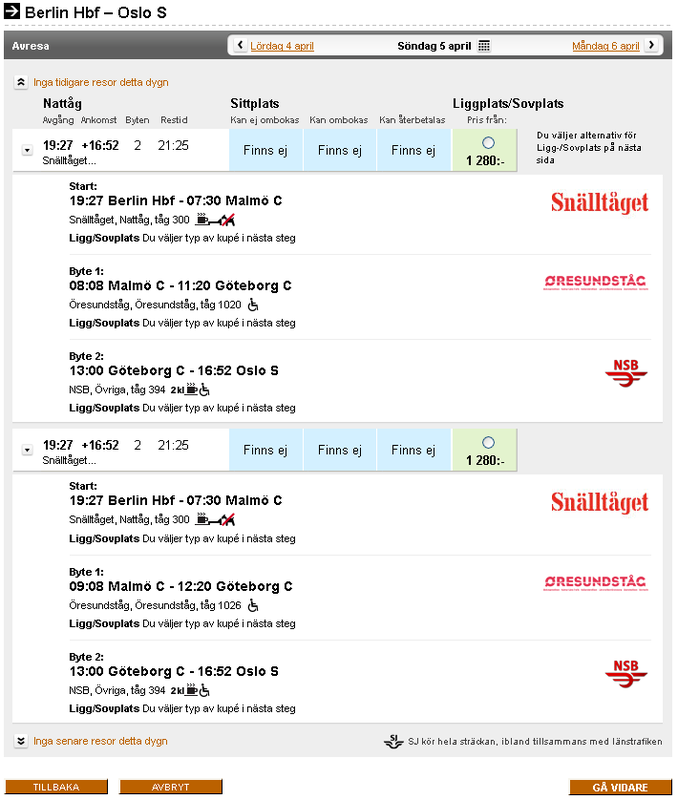 There are no other codes in brackets than 1080 in that part of your Göteborg – Berlin ticket where the route appears? Interesting. 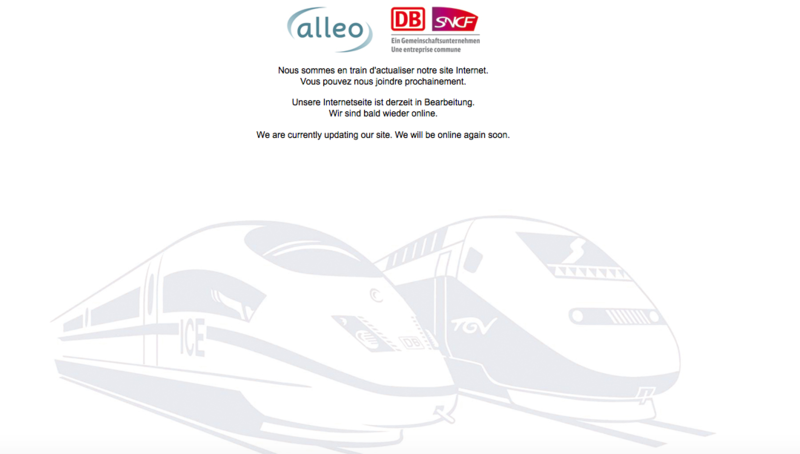 At least for Germany there’s a rather hidden webpage where you can look up which railwy operators would honour your 1080 ticket: http://www.diebefoerderer.de/Tarife.122.0.html In other countries even that’s missing. So how is a traveller like slkgjalsjgla supposed to know that his ticket wasn’t valid in Sweden? At least for future Paris trips you are going to be able to use a night train again. There are rumours that RZD will change its Moscow – Paris timetable from June so that Berlin – Paris will be an overnight trip. They already reduced their ticket prices because of the Rouble crisis some days ago and it’s bookable online at http://pass.rzd.ru/main-pass/public/en althought you’d have to choose Berlin Gor as the departure station. This is a bug of their English version only, their Russian version seems to work better. When you book the train from Gothenburg to Oslo, remember to check both SJ’s and NSB’s websites. If I want to travel tomorrow at 6.55 or 17.55, then it is cheaper to book through SJ. However, if I want to travel at 4.30 or 13.00, then it is cheaper to book through NSB. Same train, different price. I assume that you are taking an Öresund train (CIV codes 1186+3126) from Copenhagen to Gothenburg as SJ Snabbtåg (CIV code 1174) doesn’t seem to be available in the Europa-Spezial offer for that distance. Meaning: You must use company 3126 from Kastrup(gr) to Göteborg C. At Göteborg C, you must change to company 3050, which you use up to Kornsjø(gr). At Gothenburg Central Station, you will find one ticket office operated by “1174” and one ticket office operated by “3197”. The staff there might not be able to help you as you are neither travelling with “1174” nor with “3197”. If you book a through ticket from Copenhagen to Oslo at sj.se, then there are rules (http://www.samtrafiken.se/wp-content/uploads/2014/11/Resevillkor-for-Resplusresa_ENG_Galler-fran-20140101.pdf) which state that you have the right to get to your destination even in the event of a delay. It is debateable whether these rules apply if the two legs (Copenhagen-Gothenburg and Gothenburg-Oslo) are bought separately, and it is also debateable whether the rules apply if you buy your tickets from foreign (German and Norwegian) websites. In the event of trouble, try asking the staff on the train to Gothenburg for assistance. Per http://www.samtrafiken.se/wp-content/uploads/2013/12/Samtrafikplan-2014-131217.pdf the minimum connection time between two different trains at Gothenburg C is 15 minutes. You will not get any assistance whatsoever if your connection time is less than 15 minutes. I am not sure whether DB offers any seat reservations for the trains from Copenhagen to Gothenburg. If you do not have a seat reservation, then pay attention to http://www.oresundstag.se/Global/Priser%20och%20regler/Platsbokning/platsbokning_%C3%B6t%C3%A5g.pdf and make sure to choose a “blue” seat as the “red” ones may be booked. The displays above the seats are not in use and won’t tell you whether a specific seat is reserved or not. You can also reserve a seat at SJ’s website if you change the interface to English and state that you have the customer card “InterRail”, but I’m not sure whether the reservation is valid if you do not actually use an InterRail pass but instead try to use it in combination with a German train ticket. @Hans – apologies re. the commenting. My blog is so deluged with spam that I have to have the anti-spam on quite a high setting. That’s probably the reason for the problems. In Sweden, there is one number per operator. For example, there are four companies which run trains between Stockholm and Uppsala, and three diffrerent CIV numbers are in use. The fourth company, SL, does not accept tickets sold outside Sweden and therefore doesn’t need any CIV number at all. CIV numbers are not communicated to the public at the station, and it is your responsibility to take a train with a matching CIV number. Tickets bought in Sweden do not contain the CIV number but the operator’s name, so a passenger with a foreign ticket won’t be able to get help from other passengers at the station who presumably use domestic tickets. Things are done differently in for example Great Britain, where all train companies use the same CIV number, except for Eurostar which uses a different CIV number. Passengers who buy a ticket between Great Britain and Ireland need to pay attention to CIV numbers, though, as I believe that some ferry crossings have multiple ferry companies with differing CIV numbers. Ok. Sorry, it seems your blog doesn’t like me to write down the CIV numbers in brackets as they’d appear on the tickets. So it would be 0083 vs 1080. Dear Jon, the CIV numbers are indeed supposed to denote the operators. In this special case, the operators on the Danish side are the same, but not on the Swedish side. We in Austria do have similar problems. When buying tickets for South Tyrol you can choose between (valid for Trenitalia, but only regional trains, as the fast trains are global priced) and (valid for DB/ÖBB Eurocity). I am not sure what kind of code will appear if you buy a ticket for a SAD regional train. I also heard that some kinds of tickets will be honoured by the other operators, but Idk. At our second border crossing to Italy (Tarvisio) it’s even more bizarre as they will sell you a pseudo-domestic ticket for the cross border regional trains to Udine. It looks the same as if I would buy a ticket for a journey from ÖBB to another Austrian railway (like St&H). As it’s not an international ticket, I am not sure if other railways can sell tickets for those trains at all. At least there’s the possibility of buying the ticket on board, but if you’ll miss your train to Salzburg or Vienna for which you had already bought a “Sparschiene”, than bad luck. This is rather unpleasant, but I don’t know how to fix that. @slkgjalsjgla – those are, as far as I am aware, CIV numbers, but there should be one per country, and not one per operator. If CIV does not work on Øresund trains (which is what you’re implying here as far as I can tell) then that’s absurd. If you have faced such a fine, have you complained about it, and did you make any progress? At least you weren’t fined for this trouble, and no information is better than wrong information. Suppose you buy a Deutsche Bahn Europa-Spezial ticket from Germany to Stockholm using SJ’s X 2000 train. The train from Germany to Copenhagen is delayed, and you miss your connection to Stockholm. You ask the train attendant for help, who tells you to take the next train across the border to Malmö and contact SJ there. You get on the next train, and are fined 1000 Swedish crowns or 750 Danish crowns for following the train attendant’s instructions. The problem is simple. At the bottom of your ticket you have three four-digit numbers: 1080 (Germany), 1186 (Denmark) and 1174 (Sweden). The train you took requires slightly different numbers: 1186 (Denmark) and 3126 (Sweden). International ticket rules allow you to continue to your destination in the event of a broken connection, but only as long as the four-digit numbers on your ticket correspond to the four-digit numbers of the train you are taking, and there is a dozen or so different four-digit numbers for different train operators in Sweden, sometimes with several four-digit numbers operating side-by-side on the same distance.